Let’s face it – wires aren’t attractive. Wouldn’t it be better to find ways to hide wires that would disguise them more? If you’re struggling to hide all those wires and tech stuff around your home and just want it to look a little better and blend in with the decor, then you’re in the right place! I’ve put together my top tips and inspiration for you today, and I hope it helps. SIDE NOTE – Although all these ideas are definitely worth a try, please always make sure that there is plenty of air circulating around the wires/electrics to be safe rather than sorry. When dealing with electrics you need to allow heat to escape…. We’ve all been there – way too many wires than our homes can cope with. We’re constantly trying to work things into homes that just aren’t used to the load. Wires end up on show, in a mass of spaghetti under cupboards, and generally tend to be quite unsightly. In my own home we have this issue – ALL THE TIME! It was built in the 1930’s when there was less need for so many sockets etc…, so when we refurbished it a few years ago I was lucky enough to be able to add in plenty of sockets. I probably went overboard, but I was on a mission! QUICK TIP – Always have at least 1 set of sockets on each wall – to enable you to move furniture around wherever you want it. I go one step further and have 2 sets on each wall – that way you will always have a socket close by, and most of them will be hidden by furniture so it doesn’t look odd at all. Although this works perfectly when you have the luxury to add sockets, it’s not the solution for most of us. In fact – there are still a few rooms in our house where we couldn’t change things easily, and so we have been forced to place furniture in specific places in each space as a result. And don’t even get me started on the mass of wifi / DVD / router boxes we have gathered around the house…. I hope that it helps you make any decisions you need to for your own home. We all have some sort of need for tech related to paperwork in the house. Maybe you have a printer, scanner, shredder etc…. And they tend to be quite large and ugly in most rooms – unless you are lucky enough to have a separate home office (and even then, you might not want to feel like you are in a proper office when at home). This is one of the best ways I’ve seen to eliminate the need to see home office tech on a daily basis – and you could use the drawers for all your printer cartridges, paper, and other stationery – a hidden office that’s totally functional! I have a shredder, and hate the way it looks in my house. As a result I’ve ended up storing it in a cupboard most of the time and only bringing it out when I have a decent amount of paperwork to shred. The idea of having it stored in plain sight – in a basket – is genius, and I’m definitely going to give this a go. A lot of people now want that gorgeous look of putting the TV on the wall. SOLUTION #3 – USE A SHOWER POLE – SERIOUSLY! Another simple way to hide boxes that need to be out on show – such as a TV box, is to wrap them in a metal foil like the example below. These are the fixes you need if you are finding it hard to have furniture exactly where you want it – and you need to allow for lamps etc… , or if you just need to hide those pesky wires out of sight. SOLUTION #6 – HIDE WIRES IN PLAIN SIGHT! Another quick trick for wires would be to attach a basket of some sort to the underside (or even the back) of the furniture and put the charger and wires into there instead of directly on the floor. I wrote a post a while back on this as it was something that annoyed me and was such an easy solution. You can read the whole posts HERE. Hidden away from sight – but everything in one place. I love it! 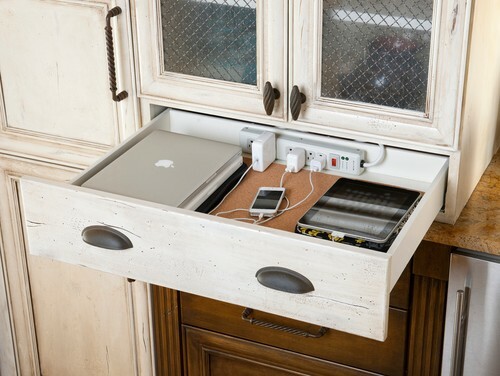 If you like the idea of having a charging station, but are unsure about using a drawer, then this would be ideal! If you don’t want to get creative and make anything, then there are great ready made options around to take advantage of. This charging station would work great for families that have lots of tech, as you can charge several things at once in a neat way. It’s also a great idea for keeping them all together at bedtime (so the kids don’t take them upstairs… hopefully! So, there you have it, 12 ingenious ways to hide wires all around the house! If you start thinking a little outside the box (or in this case, inside a few boxes!) for inspiration, you may find that wires and tech around the home become less of a nuisance for you. Are you inspired to give any of these a try?, do you have any other ideas that would work well?, I’d love to know so please leave a comment below. Previous Post: « ULTIMATE GUIDE – OVER 100 AMAZING CHRISTMAS TIPS FOR YOUR BEST CHRISTMAS EVER!